We are looking for entrepreneurs who want to own & operate their own franchise business. For ceiling fan installation or replacement, call a Sears Handyman technician to get your ceiling fan back running. Ceiling fans can dramatically affect the comfort of your home during both the summer and winter months, when temperatures reach extremes of heat and cold. Ceiling fans can also reduce your reliance on your heating and cooling units while using minimal amounts of energy themselves. A sought-after home amenity, a ceiling fan helps control temperatures in frequently used rooms, but when a ceiling fan breaks, it essentially becomes useless, and your comfort at home may suffer as a result. Trying to fix a ceiling fan yourself can be a difficult task. Accessing a ceiling fan problem usually involves balancing on a ladder while inspecting the fan to determine the cause of the problem. Typically, the fan will have to be removed to have its working parts examined, fixed, and restored. Some homeowners may lack the necessary equipment or knowledge to access, remove, and replace their broken ceiling fan. Likewise, some homeowners have conditions that make it difficult for them to mount a ladder safely, much less do so while dismantling equipment. For these and other reasons, a Sears Handyman can assist with replacing a broken ceiling fan by installing a new one. 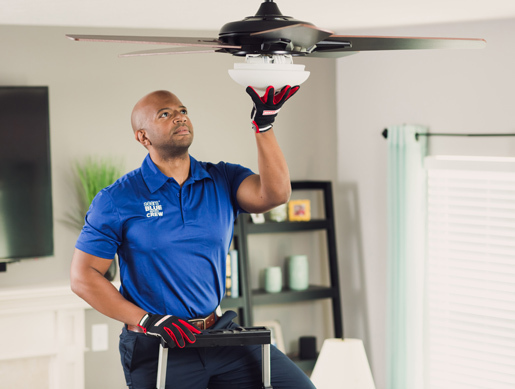 Instead of a ceiling fan replacement, sometimes a fan may only need some light maintenance to return it to working condition. 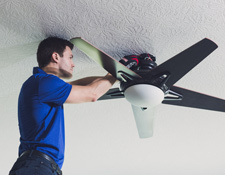 If your ceiling fan is wobbling while it runs, makes unusual noises, or operates inconsistently, the fan may need an adjustment to get it returned to regular operation. If your fan is experiencing problems like those listed above, contact a Sears Handyman technician today and discuss options and set up a house call. Our technician will arrange an appointment convenient for your schedule so he can inspect your fan and determine the best way to proceed with a repair or replacement. Receive a free estimate and schedule your handyman service online today. A Sears representative will contact you promptly, usually within the next business day. Copyright © 2019 Sears Home Services. All Rights Reserved. All Sears Handyman Solutions Franchise Locations are Independently Owned and Operated. Available Services; Pricing; Coupons & Promotions; and Hours of Operation may vary by location.